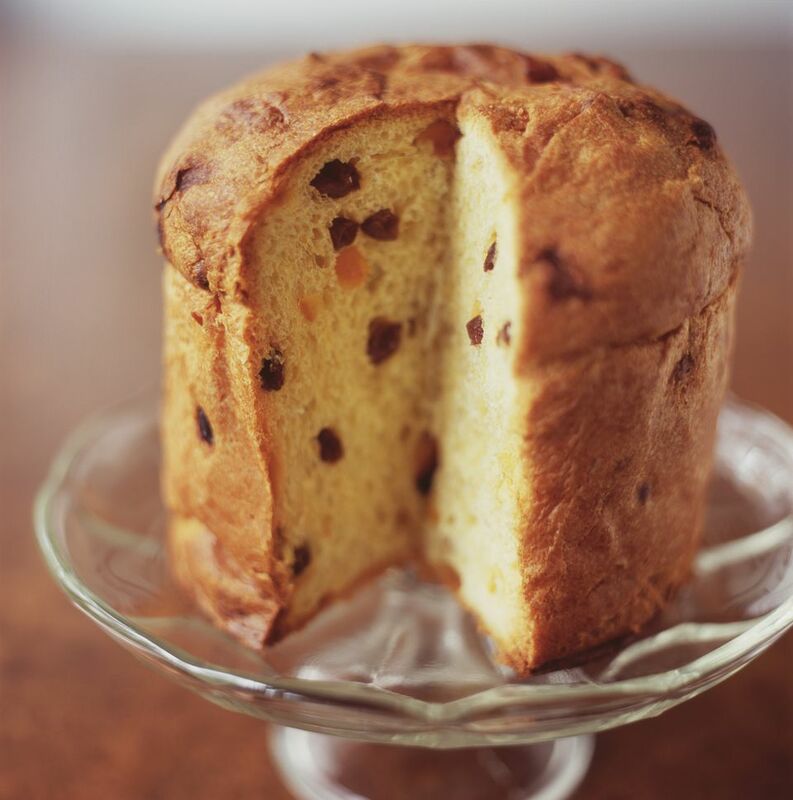 Panettone is a delicious holiday fruitcake that is traditionally rather labor intensive -- it requires several days of fermentation to develop the flavor. This panettone recipe is much quicker to make -- with only one rising period -- and has a wonderful buttery, sweet citrus flavor. Panettones make great gifts for the holidays and can be any size; small individual panettones are fun to make and give. Panettones are often baked in special paper molds that you can order online or buy at upscale cooking stores. Artfully arranged parchment paper, bread pans or coffee cans also work well for presentation. Drizzle a quick frosting over the top of the cake for a little extra decoration or just dust the top with powdered sugar. Heat the milk on low heat until it's warm to the touch, about 100 F, and remove from the heat. Stir in the yeast and 1 cup flour. Mix well and set aside, covered, for 15 to 20 minutes. Add the butter, sugar, salt, eggs (3 whole and 4 yolks), vanilla, orange juice, and orange and lemon zest to the bowl of a food processor. Pulse until the butter is mixed in and broken up and the mixture looks curdled. Add the yeast mixture and pulse briefly. Add the remaining flour, one cup at a time, and pulse until the dough starts to come together. Pour the dough -- it will be sticky and wet -- onto a lightly floured counter and sprinkle nuts and raisins on top. Use a dough scraper or a large spatula to fold and knead the dough, adding a little extra flour if necessary, until dough is well mixed and smooth; it will still be sticky. Using floured hands, shape the dough into a ball and place the dough inside a 6- to 7-inch diameter panettone mold, bread pan or coffee can. Brush the top of the dough with melted butter and then place it in a warm place to rise. Let the dough rise for 2 to 4 hours until it is almost doubled in size. Brush with a beaten egg. Preheat the oven to 350 F. Bake the panettone until it has risen, is golden brown and sounds slightly hollow when you tap on it gently, about 40 minutes.